Arianna Huffington has encountered her fair share of ups-and-downs on her journey to becoming one of the most influential women in the world. Today, the President and Editor-in-Chief of The Huffington Post has made it a priority to share the life-affirming secrets that she has learned along the way. Her teachings about success, fear, and failure can especially show how each of us can increase our levels of life fulfillment. On July 15th, in 1950, prominent Greek journalist Konstantinos Stassinopoulus and his wife Elli welcomed their first daughter, Arianna, into the world. For the Stassinopoulus parents, showing Arianna, and her younger sister Agapi, how important education and self-care would be for their future success took great precedent in the girls’ childhoods. At the age of 16, Arianna and her family moved to Great Britain, where she began studying at the prestigious Cambridge University. Arianna was a highly gifted student and went on to become the first foreign-born president of the Cambridge Union Debate Society before graduating with a Masters degree in Economics. After graduating from Cambridge, Arianna decided to stay in London after she met a well-known English journalist by the name of Bernard Levin. While the relationship between the pair was romantic in nature, Levin also took the time to mentor Arianna, who had decided to pursue a career as a writer. In 1973, two years after meeting Levin, Arianna published her first book titled The Female Woman. It was in 1980, after her relationship with Levin fizzled, that Arianna Stassinopoulus decided to move to the United States. Over the coming years, she continued to work on her writing and in 1985 met Republican politician Michael Huffington, whom she married one year later. It wasn’t however until 1994, during Michael’s unsuccessful Senate bid, that Arianna Huffington would rise to national prominence for the role she played in his campaign. After having two children, Michael and Arianna divorced in 1997. For Huffington, the years following the divorce were largely spent in the political arena, which was highlighted by a brief run for California Governor against Arnold Schwarzenegger in 2003. It was until 2005 when Huffington decided to pursue a venture of a different type. Along with the support of wealthy businessman Kenneth Lerer, Huffington launched an online news website called The Huffington Post, which has since revolutionized the way that news is reported on the Internet. 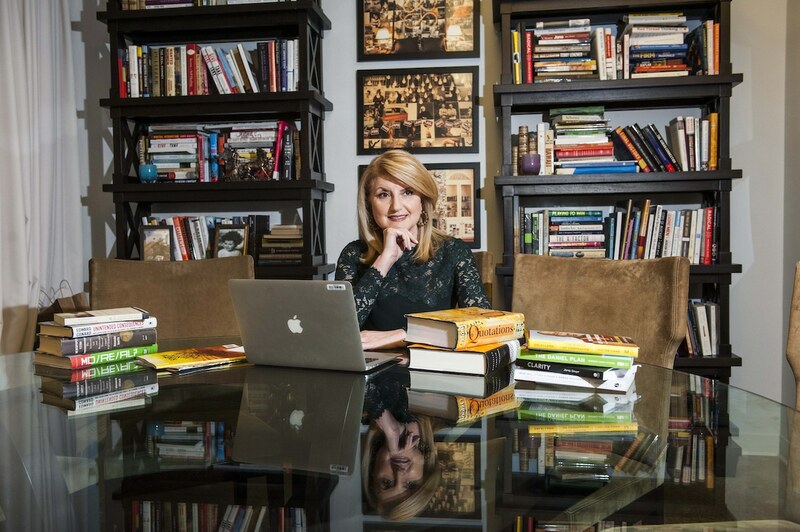 Today, Arianna Huffington is still the President and Editor-in-Chief of The Huffington Post. She has been recognized as one of Time’s most influential people and Forbes’ most powerful women. Throughout her career she has regularly hosted or contributed to various television and radio programs. She has also written 15 books, including titles such as: Thrive: The Third Metric to Redefining Success and Creating a Life of Well-Being, Wisdom, and Wonder & On Becoming Fearless…In Love, Work, and Life. The Third Metric of Success: Arianna Huffington has seen how the conventional metrics of success, which are based upon the acquisition of money and status, rarely lead individuals to the fulfillment and happiness that they desire and deserve. Instead of focusing our attention on solely acquiring these two metrics, she tells us that we need to challenge our basic assumptions about what success is. She believes that each of us can experience greater levels of fulfillment, which is what truly matters, by adding a 3rd metric to the success formula that revolves around our own personal development and well-being. Huffington’s third metric of success, which was prominently featured in her 2014 book Thrive, revolves around four pillars: Well-Being, Wisdom, Wonder, and Giving. She tells us that if we want to experience higher levels of happiness, fulfillment, and true success, we should find time to disconnect from the outside world, strive to stop working outside of working hours, spend time in meditation, and look to acquire life-affirming experiences rather than paychecks.